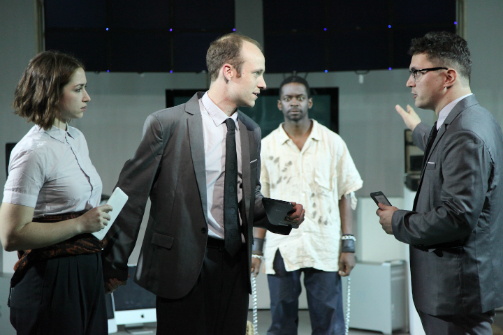 Atalanta Siegel, BK Dawson, Ed Brown and Ben Adducchio in Orwell's 1984. Photo by Stephen Mosher. BOTTOM LINE: A well-acted and timely adaptation of the famous novel examining oligarchy and mind control. Seventy years ago, George Orwell wrote the gripping and terrifying 1984, depicting a world without free will. The novel was intended to be a warning, yet it is looking more and more like a premonition: people of the twenty-first century are currently living with a heightened level of government surveillance. In Michael Gene Sullivan’s adaptation (making its NYC debut), we retrace the story of Winston Smith within the confinement of his interrogation room, as he awaits his fate of being sent to the dreaded Room 101. B.K. Dawson plays Winston Smith, portraying a complex character with absolute charm and vulnerability. The play starts in Smith’s cell, where Party Members are given orders to extract a full confession of the prisoner’s "thoughtcrime." With Smith’s diary and rebel leader Emmanuel Goldstein’s manuscript as evidence, Party Members proceed to re-enact every step of Smith’s path towards incarceration, starting from his first exchange with Julia, who would later become his lover, and his first doubts about Big Brother. Director Dave Stishan effectively creates the environment of a dystopia along with the design team: Ed Brown’s set and SourceFocus LLC’s videos make the audience feel as though they, too, are under constant surveillance. Igor Yachmenov’s sound design further enhances the tension within the pressure-cooker-like environment. The ensemble—Ben Adducchio, Ed Brown, Jerry Brown Jr., Rob Mobley, and Atalanta Siegel—play the five Party Members who also represent various characters that Smith encountered in the process of committing his "crime." The actors portray with convincing clarity the homogeneous members of a society that praises conformity and loathes individuality. Brown plays the Party Member who represents Smith in various scenarios with Siegel’s Julia. Their palpable chemistry brings out the tender moments of a rigid and unforgiving, machine-like society. As Smith is coerced into confessing, as well as betraying his love and sanity, the production asks the audience, "In the eyes of an almighty, do you use the knowledge acquired to become free, or do you remain ignorant and obedient?" Orwell's 1984 presents a stark, clear image of what the "worst" would be like, and shows how close it is to our reality. This production is surely for those who enjoy the writings of Orwell, Vonnegut, and Bradbury, as well as The Twilight Zone or the more contemporary Black Mirror. However, the timeliness of the production, coinciding with the presidential election, also speaks to a larger audience, to consider our individual roles in the battle against oppression. Orwell's 1984 is by Michael Gene Sullivan, based on a novel by George Orwell. Directed by Dave Stishan. Set Design is by Ed Brown. Costume Design is by Dave Stishan. Lighting Design is by Sarah Burke. Video Design is by SourceFocus LLC. Original Music and Sound Design is by Igor Yachmenov. Additional Music is by Name. Production Manager is Ed Brown. The cast is Ben Adducchio, Ed Brown, Jerry Brown, Jr., B.K. Dawson, Rob Mobley, and Atalanta Siegel.